Toronto proggers Saga will return to Montreal this spring. The event will be held on Friday, April 12, 2019 at the Club Soda (1225 St. Laurent Blvd.). With twenty-one studio albums, Saga members have produced hits such as On The Loose, The Flyer and Scratching The Surface. They have sold more than eight million albums worldwide. Formed in 1977, Saga has earned many followers around the world its unique musical style, defined by Ian Crichton's guitar staccatos backed up by synthesizers and intricate arrangements that often combine three musicians. Quebec has always been the Saga stronghold in America, where they gave many performances including some unforgettable passages at the Montreal Forum. Tickets are $50, available through the Club Soda box office. The Tea Party will be at the MTelus Metropolis (59 St-Catherine East, Montreal) on Friday, April 12, 2019. The famous canadian indie/prog band will present new music as part of their Canadian Black River Tour. Doors at 6:30 PM, Show at 8:00 PM. Tickets are $47.75, available through evenko and at the MTelus Metropolis boxoffice. Nick Mason, Pink Floyd's celebrated drummer will present his show "A saucerful of secrets" on Monday, April 15, 2019 at the Salle Wilfrid-Pelletier of the Place des Arts. Nick Mason is planning to perform some classic Floyd songs, but don’t expect “Comfortably Numb” or “Another Brick in the Wall.” Mason instead will be digging deep into the Pink Floyd archives to offer tunes not heard live in America for a long time, if ever. Nick Mason’s Saucerful of Secrets will be jamming to pre-“Dark Side of the Moon” material. Doors at 6:45 PM, show at 7:30 PM. Tickets on sale Nov. 5 at 10 AM through evenko or at the Place des Arts boxoffice. Tribute band Brit Floyd will be at Salle Wilfrid-Pelletier of the Place des Arts on Saturday, April 6, 2019. The band is pleased to announce the first of a run of shows in USA and Canada, the 2019 tour entitled The World’s Greatest Pink Floyd Show BRIT FLOYD Another Brick in the Wall 2019 Celebrating 40 years of The Wall, plus much more. Brit Floyd, the world’s greatest Pink Floyd tribute show, returns to the stage in 2019 with its most ambitious and best production yet, a very special 40th Anniversary retrospective of Pink Floyd’s iconic rock opera, ‘The Wall’. Released in November 1979, a semi-autobiographical concept album from the mind of Pink Floyd founding member Roger Waters, The Wall remains one of the biggest selling albums of all time, and an important moment in Rock music history. As well as performing a host of musical highlights from The Wall, Brit Floyd will perform classic gems from The Dark Side of the Moon, Wish You Were Here, Animals and The Division Bell plus lots more. Doors at 7:15 PM, Show at 8:00 PM. Tickets are available through evenko. Heavy Montréal presents Baroness and Deafheaven at the Théâtre Corona (2490 Notre-Dame Steet West, Montreal) on Wednesday, April 3, 2019, accompanied by Zeal & Ardor. Doors at 6:30 PM, show at 7:30 PM. Tickets are $34.50 - $38.50, available through Greenland.ca and at the Corona boxoffice. The British group Muse will be in Montreal on Saturday, March 30, 2019 at the Bell Center, as part of their Simulation Theory tour. Their new studio album, Simulation Theory, was released on November 9 through Warner Music. The eleven-track record was produced by the band, along with producers Rich Costey, Mike Elizondo, Shellback and Timbaland. Each of the album’s songs will be accompanied by a video. When you purchase an online ticket for the Muse show, you will have the choice of receiving the CD or digital copy of the new Simulation Theory album. You will receive an email telling you how to get your album after buying your ticket. Doors at 18:30, Show at 20:00. Tickets are available through evenko. evenko presents Dream Theater on Friday, April 5, 2019 at Salle Wilfrid-Pelletier of the Place des Arts, celebrating the 20th anniversary of their seminal album Metropolis Pt. 2 Scenes from a Memory. Two-time Grammy-nominated and millions-selling progressive music titans Dream Theater announce the forthcoming worldwide release of their 14th studio album, Distance Over Time on February 22, 2019, followed by a North-American Tour. Distance Over Time showcases a newfound creativity for Dream Theater while maintaining the elements that have garnered them devoted fans around the globe. The band will be also celebrating the 20th anniversary of the album Metropolis Pt. 2 Scenes from a Memory, and will be playing in its entirety. Progressive metal pioneers Dream Theater — James LaBrie (Vocals), John Petrucci (Guitars), Jordan Rudess (Keyboards), John Myung (Bass), and Mike Mangini (Drums) — share a unique bond with one of the most passionate fan bases around the globe as evidenced by their two Grammy Award nominations and 15 million records sold worldwide. Show at 8:00 PM. Tickets available through evenko and at the Place des Arts boxoffice. Roine Stolt's The Flower King - Manifesto Of An Alchemist : Roine Stolt, known as the guitarist, singer, writer and at times band leader of the groups The Flower Kings, Transatlantic, Agents of Mercy, Kaipa DC, as well as from his work with prog icon Jon Anderson and the new super-group The Sea Within, is releasing a new album on the 23rd November 2018. 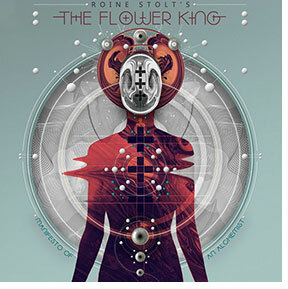 Under the moniker ROINE STOLT’S THE FLOWER KING, Manifesto Of An Alchemist offers 10 songs and almost 70 minutes of playing time celebrating the style Roine is most revered for: progressive rock, richly orchestrated with all the trademark elements from four decades of the genre. The album features a host of other musicians, including long-time collaborators Jonas Reingold, Hasse Froberg & Michael Stolt, as well as fellow The Sea Within member Marco Minnemann, Max Lorentz, Zach Kamins, Rob Townsend & Nad Sylvan. Frost* and Mystery in Montreal tonight! British band Frost* and Montreal's Mystery will be at Salle Jean-Paul Tardif for a long-awaited double-bill for Progressive Rock fans. The event will take place on Friday, March 22, 2019. The Frost*/Mystery duo will also be in Montreal on Thursday, March 21, 2019 at La Tulipe (4530 Papineau). Frost* is a British supergroup formed in 2004 by keyboardist Jem Godfrey. Their sound is very modern and dynamic. In 2017, their album Falling Satellites was in the top 10 of several critics of the music press. The band also features Craig Bundell on drums (Steven Wilson), John Mitchell on guitar (Arena, It Bites), Nathan King on bass (Level 42, It Bites). The evening will begin with the performance of the excellent Montreal band Mystery. They will present brand new material from their latest album Lies and Butterflies as well as highlights from previous albums. Mystery is composed of: Michel St-Père (guitar), François Fournier (bass), Jean-Sébastien Goyette (drums), Antoine Michaud (keyboards), Jean Pageau (vocals and flute) and Sylvain Moineau (guitar). Mystery is one of the most respected progressive rock bands in the country. Very popular in Europe, they will begin in April, a tour that will take them to Poland, Belgium, the Netherlands and Germany. Tickets for the Quebec City show available through the Salle Jean-Paul Tardif box office. Tickets for the Montreal show available through Admission. Sylvain Auclair's amazing Police/Sting tribute show Lazarus Heart will be at the Calistoga Grill (235, Boul. St-Jean, Pointe-Claire) on Saturday, March 16, 2019. Check-out the Lazarus Heart video clip at the Calistoga Grill. The incredible musical revue Prog Story will be back in Montreal on Thursday, March 14, 2019 at 8:00 pm at the Club Soda (1225 St. Laurent Blvd.). Prog Story presents an original concept tracing the best moments of British progressive rock from the 70s in music and images. Featuring the music of Genesis, Yes, King Crimson, ELP, Jethro Tull, Pink Floyd and Gentle Giant as part of the setlist. The producer gathered a talented team of eight musicians and singers selected from the Quebec elite. The band is composed of Francis Grégoire (keyboards and musical direction), Antoine Baril (drums), Christian Pacaud (bass), Gabriel Cyr (guitar), Jean-Philippe Major (vocals), Gabriel-Antoine Vallée (vocals and guitar), Alex Donati (vocals and guitar) and Mathieu Pilote (vocals, flute, saxophone). Prog Story is a unique event that chronicles the story of progressive rock while offering you high-level musicianship with images and exclusive interviews from important musicians of that era. Tickets are $45, available through the Club Soda box office. Heavy Montréal presents American heavy metal band Disturbed, at Place Bell (1950 Claude-Gagné Street, Laval) on Friday, March 1st, 2019 as part of their Evolution world tour, accompanied by Three Days Grace. Doors at 6:30 pm, show at 7:30 pm. Tickets available through evenko and at the Place Bell boxoffice. Don't miss A Bowie Celebration, The David Bowie Alumni Tour, at the Metropolis MTelus (59 Ste-Catherine Street East, Montreal) on Saturday, March 2, 2019. Doors at 6:30 PM, show at 8:00 PM. Tickets are $59 - $198, available through Greenland.ca and at the Metropolis boxoffice. Heavy Montreal Presents Within Temptation with In Flames at the Olympia de Montréal (1004 St-Catherine St East) on Tuesday, March 5, 2019, with opening band Smash into Pieces. The Dutch symphonic metal band will present new material from their latest album Resist. Doors at 5:00 PM, show at 7:00 PM. Tickets are $60 to $155, available through evenko and at the Olympia boxoffice. The Mick Pointer Band will be at Club Soda on Friday, February 22, 2019 to present his show Script Revisited. Mick Pointer's show is inspired by Marillion's first world tour. For this, he surrounded himself with an all-star team including Nick Barrett (Pendragon) on guitar, Mike Varty (Landmarq) on keyboards, Ian Salmon on bass (ex-Arena) and the excellent singer Brian Cummins (Carpet Crawlers). Mick Pointer, Marillion's original drummer, had the idea of presenting Script Revisited in 2013 on the occasion of the 30th anniversary of the tour. Since then, the band has played in several European countries. Fans of the Marillion Fish era will have their highest expectations filled with the Script Revisited show. It will be the first visit to America for the Mick Pointer Band. Doors at 7:00 PM, show at 8:00 PM. Tickets are $49, available via LePointdeVente.com. General admission. All ages. The legendary guitarist of Swedish progressive rock band The Flower Kings, Roine Stolt, will be in Montreal on Thursday, February 28, 2019 at the Club Soda (1225 St. Laurent Blvd, Montreal) and in Quebec City on Friday March 1, 2019, at Salle Jean-Paul Tardif. He will present the music of his new album Roine Stolt 's The Flower King "Manifesto of an Alchemist" which will be available in November. The Flower Kings was formed in 1994 and was one of the leading bands in the progressive rock renaissance of the 1990s. They have twelve studio albums to their credit. Roine Stolt will be accompanied by Hasse Froberg (vocals, guitar), Jonas Reingold (bass), Zach Kamins (keyboards) and Mirko Demaio (drums). Doors at 19h, show at 20h. Tickets for the Montreal show are $54, available through the Club Soda box office and www.lepointdevente.com. General admission seated places. evenko presents Legendary composer, performer and producer Alan Parsons, at the Théâtre Maisonneuve of the Place des Arts in Montreal on Sunday, February 24, 2019. Parsons continues his world tour of the Alan Parsons Live project that began in 2014 and will play his greatest hits including Time, Don't Answer Me, Eye In The Sky, Lucifer, I Wouldn't Want To Be Like You and Games People Play. He will be accompanied by six musicians and a singer. Alan Parsons began his career as an assistant sound engineer in the prestigious Abbey Road studios. At the age of 18, he worked on the the legendary Beatles albums Abbey Road and Let it be. And then he was the sound engineer for Pink Floyd's album Dark Side of the Moon. This album revolutionized studio recording techniques worldwide. More recently, Parsons was the sound engineer for Steven Wilson's album The Raven That Refused To Sing, released in 2013. After creating The Alan Parsons Project with Eric Woolfson, the artist has recorded ten studio albums from 1976. The British musician has sold over 45 million albums in addition to being nominated for eleven Grammy Awards. Show at 8:00 PM. Tickets on sale November 9 at 10 am and are available through evenko and at the Place Des Arts boxoffice. The prolific singer and multi-instrumentalist Neal Morse will perform in Montreal on Monday, February 18, 2019 at Club Soda (1225 St-Laurent, Montreal). The Neal Morse band is composed of Randy George (bass), Eric Gillette (keyboards, guitar, vocals), Bill Hubauer (keyboards, violin, saxophone and vocals), and popular drummer Mike Portnoy. Show at 8:00 PM, tickets are $54, available through LePointDeVente.com. The Musical Box presents A Genesis Extravaganza at Salle Wilfrid-Pelletier of the Place des Arts on Saturday, February 9, 2019. In an all-out performance of live visual signature stunts, a museum-worthy array of vintage instruments and a dizzying pace of iconic tracks and stage rarities, The Musical Box indulges for the 1st time in 25 years an intense 3-act voyage into the world of early Genesis. Act 1 is The Wind’s Tail, Act 2 is Broadway Melodies and act 3 is Before the Ordeal. Doors at 7:15 PM - Show at at 8:00 PM. Tickets are $53.70 to $85.20, available through www.evenko.ca. Martin Levac will present his tribute show to Phil Collins Dance Into the Light on Saturday, January 19, 2019 at Théâtre Desjardins (1111, rue Lapierre, Monréal). Acclaimed by the public and recognized by Phil Collins, Martin Levac, accompanied by his seven musicians, will make you go through a range of emotions by interpreting in a more than perfect way the hits of this great musical icon. Show at 8pm. Tickets are $50, available through the Théâtre Desjardins box office. Don't miss an evening of prog metal fun as Fractal Cypher will launch their latest mini-album Prelude To An Impending Outcome, at Foufounes Électriques (87, Ste Catherine East, Montreal) on Friday, January 11, 2019, accompanied by Dark Aeon, who will launch their latest album Shattered Monolith, also accompanied by Unbeing, Unveil and Moth, who will begin the evening. Tickets are $12, available through the Foufounes boxoffice and at the door on the day of the show. General Admission. 18+.